in natural colours or dyed in the colour of your choice. Alpaca or wool duvets are custom made with local fleece. We can make custom sizes for your boat or recreation vehicle or standard sizes for your bed. All the warmth, with no allergies. Our most popular yarn is a blend of 50% mohair and 50% wool. natural colours or gorgeous colours including variegated. 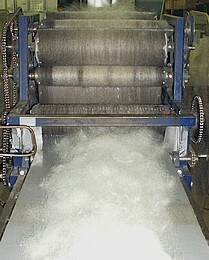 to producing batts, roving, soft-spun or plied yarns. including wool, alpaca, llama and mohair. Please call first to arrange your tour.